So in the spirit of trying to see the bigger picture, here is a little post about the bathroom. There is one on the first floor, a “family” bathroom if you like, and then an en-suite bathroom on the top floor which despite it’s miniature size does in fact contain a bath. The family bathroom leaves a lot to be desired. We have a rickety old cupboard that houses the boiler; a bath which I’ve since converted to use as a dog-washer and paint-cleaner with an electric shower at one end (doesn’t work) and one of those tap-shower-head-attachment thingies at the other end which does work but you can’t shower with it since there’s no screen or curtain. There is black lino on the floor that comes up every time you try to clean it and a toilet that takes an age to fill once flushed. The bathroom door needs a good shove to make it close properly. The entire room is tiled. The ONLY good thing about the bathroom is that it has a lovely big window, albeit covered in diamond patterned leading. At least it lets in a lot of light – bathrooms without windows make me shudder. We don’t have a toilet or cloakroom on the ground floor so unfortunately at the moment guests do have to use this bathroom but well, it is what it is. So added to the long list of revamps is this room. We’d like to relocate the boiler to the kitchen, which will become the utility room, so we can free up space to put a stand alone shower in the bathroom. We’d then switch the bath so it’s positioned alongside the window, put towel rails up on the wall to keep them off the floor and relocate the basin and toilet. In my head it sounds so easy but I know it will be anything but. There are a few people on our road at the moment having ground floor extensions at the back and some of them are extending their bathrooms slightly. We have thought about this and may see how much it would cost to do it at the same time as we do the other building work. It’s all a pipedream, our building work is the 4-5 year plan rather than anything sooner than that so the bathroom won’t be touched for a while. It’s not brilliant by any means but it is at least a working shower that guests can use and it’s very hot and has pretty good power. Eventually we want to make the en-suite into a wet room, there’s no need for two baths in the house when there are only two of us and Pete never has one. This would hopefully be a little less expensive to pull off so we might look at it next year. We’ve got a long way to go but little by little things are starting to take shape. Do you have a lovely bathroom or maybe dream of the perfect one? What’s your favourite room in the house? Love that we’re not the only ones that hate our bathroom. Yours looks like it’s a great size which definitely gives you a load of flexibility when designing it. Can’t wait to see what you come up with! PS. Can’t believe the New York apartment has already taken – would have been perfect in our property portfolio! It sounds like you are seriously busy in your house – but it is going to look amazing when you have finished. I think it already looks a lot better than when you moved in and it’s amazing what you can achieve with a few cosmetic changes. 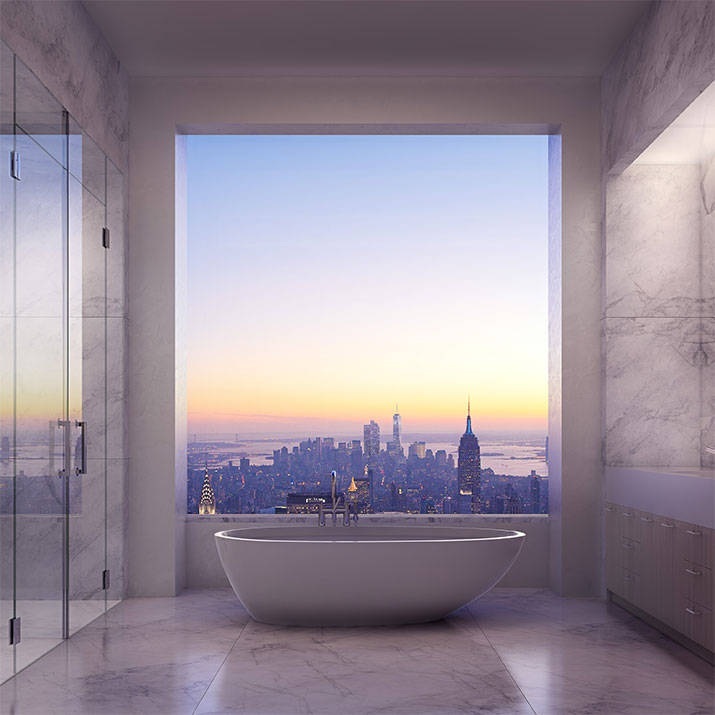 PS that bathroom in New York looks phenomenal!